F Grass is a relatively new addition to public art in Vancouver in Harbour Green park on Coal Harbour in Vancouver at the north end of Bute Street at Cordova Street. Ai Weiwei is one of the most influential artists and human rights activists of our time. His passport withheld since 2011, he chose this location through photos and created the site-specific artwork from his Beijing studio. Using ordinary grass as a metaphor, he creates something akin to a blockade of iron spices. From above, the individual case iron blades collectively take the shape of an "F". Each blade is symbolic of countless ordinary individuals who collectively become a resilient, powerful force. In China, the character for "grass" is pronounced the same as the F-word obscenity. Ai WeiWei has often used it interchangeably as a defiant act against censorship. Free films, interviews and learning resources for teachers and parents. 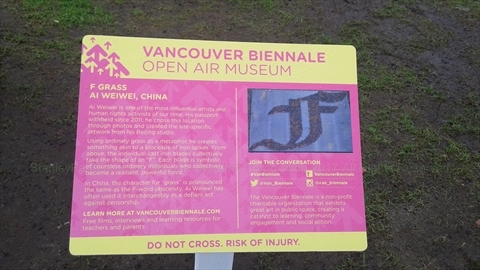 The Vancouver Biennale is a non-profit charitable organization that exhibits great art in public space, creating a catalyst to learning, community engagement and social action. Do not cross risk of injury. 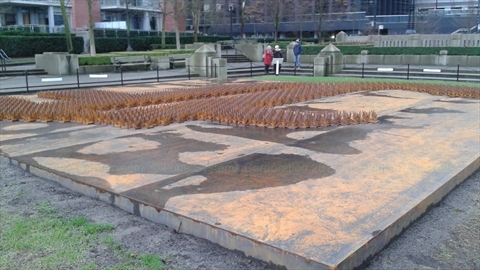 Where is F Grass Art near Coal Harbour, Vancouver, B.C., Canada? F Grass is located in Harbour Green Park at Coal Harbour.